Bebe visited the Ren Faire with me – and of course he needed his own garb. So forgetful Mama threw something together very quickly. 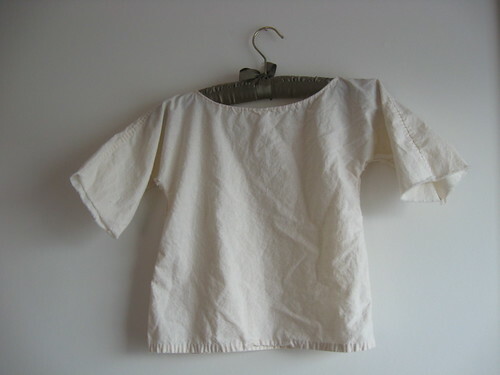 Fortunately, most toddlers in the Renaissance England (unless they were from noble families) just wore simple smocks. Add sandals, a cloth diaper covering, head covering (optional), and bing! Toddler costume for the Ren Faire. These pictures were recreated/taken afterward, since I didn’t have time to take them in process nor while playing at the Faire. There will be 4 pieces of fabric to cut out and sew together: front, back, and 2 small underarm gussets. 1. Select a piece of child’s clothing that’s about the desired length (around knee-length gives them room to run/jump/stagger without getting tangled in fabric). 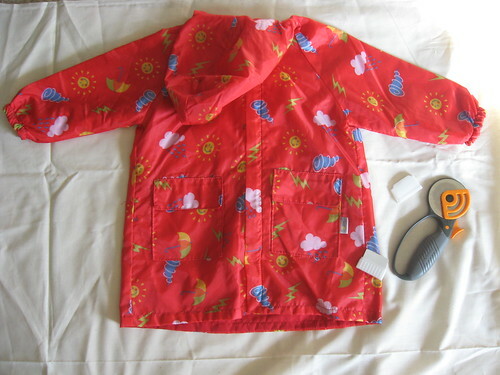 In this case, Bebe’s rain jacket was perfect. 2. Fold selected fabric in half, then lay jacket on top. Beginning in the MIDDLE BOTTOM edge, trace around the jacket about 1-1.5″ away from edge (for seam allowance – can do less if you use a serger). Sleeves should just be big rectangles, so adjust your outline accordingly if your model sleeves slant down from the shoulders. Neckline will be wide and slightly scooped. Continue around until you reach the TOP MIDDLE edge. You have now outlined half of the jacket onto the fabric. 3. This gives you a quick and easily symmetrical way to cut out front and back pieces at the same time. Remove jacket & fold fabric in half lengthwise so that the outline is on top and the unmarked half is beneath. Cut along marked line. Since the fabric is folded, cutting this one quarter gives you 2 whole pieces. 4. From scraps, cut out two 2″ squares for the underarm gussets. Hem edges for each square. 5. Pin front and back smock pieces together. Cut small slashes (straight cuts) along the neckline and a few notches (v-cuts) along the side hems to accommodate the slight curves. 6. Unless you have a serger, use French seams or Felled seams to sew front & back pieces together so that there are no raw edges against toddler’s skin (also to prevent fraying). 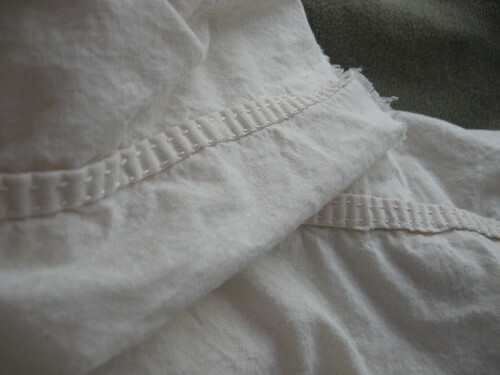 I use a weird mix between French & Felled seams: fold and press down 0.5″, then fold that over and press again, pin and sew – raw edge is enclosed. To tack the seam down, you can use a zig-zag stitch or sew 2 lines of straight stitch (as I did). Starting with top seam of left arm, from neckline to wrist. Next seam & sew the bottom arms, starting from wrist toward the underarm. When you are near the underarm, STOP. Pin the square gusset into place: two corners go in the square where arm meets side, opposite two corners go in the “V” between the arm seam and the side seam. Sew gusset in place, then continue with side seam. Repeat on the other side of smock. 7. Pin and hem the bottom edge and and neckline. With neckline, make sure to sew as near to the edge of the fold as possible, so that you will have room to thread a piece of yarn/cord/ribbon to make a gather tie. 8. Wrist edges can also be gather-seamed or left raw – be warned that raw edges will really fray in the wash unless you run a ribbon or tight stitch around the edge. 9. 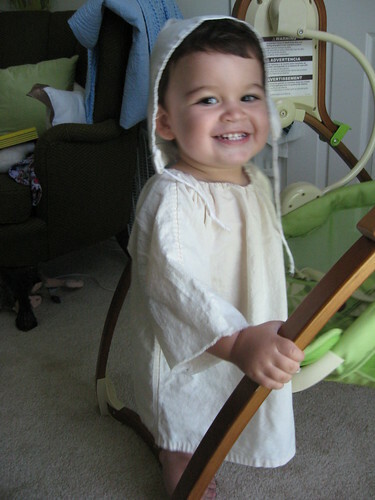 Place smock on child with the tie in back (for very young children) or front. Neckline will be very, very wide (easy to get on/off), so make sure to pull the gather closed to where you want it, then tie in place with a bow. And if you want a quick & easy coif (head covering), the one shown on Bebe is just a 9″ x 18″ piece of muslin, folded in half so that it is 9″ x 9″ square, then sewn together along 2 edges and hemmed open on the other 2 edges with a piece of yarn run through the seam of one of the open edges so that you can tie it under his chin. Super simple.